Han and Chewie go back to smuggling… for a Hutt?! 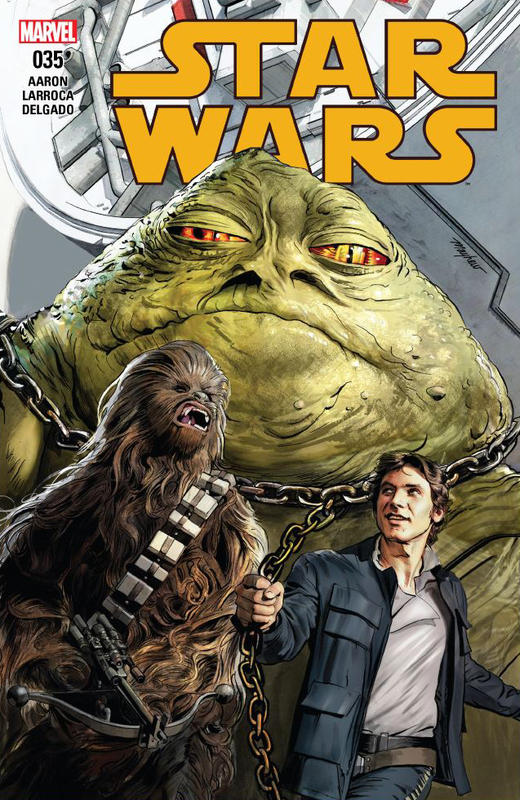 STAR WARS #35 is a Han and Chewie centric story focusing on the transport of Grakkus The Hutt to the outer rim. Writer Jason Aaron starts off strong with the characterization of Han Solo which is spot on for Solo. Han’s wit, snarky remarks, and sarcasm is on full display in his encounter with Mon Motha and the assignment she asks him to take on. The overall story is entertaining but fails to reveal much else outside of a single mission to help the rebellion. Han’s reluctance and eventual acceptance of the mission are typical of the character but I wished there were more self-doubt and hesitation. The last few issues of the main Star Wars titles have been jumping from team to team. Luke and Leia to Lando and Sana to Han and Chewie. While fun, in and of themselves, I look forward to a series of issues with the same recurring characters and a more elaborate storyline. 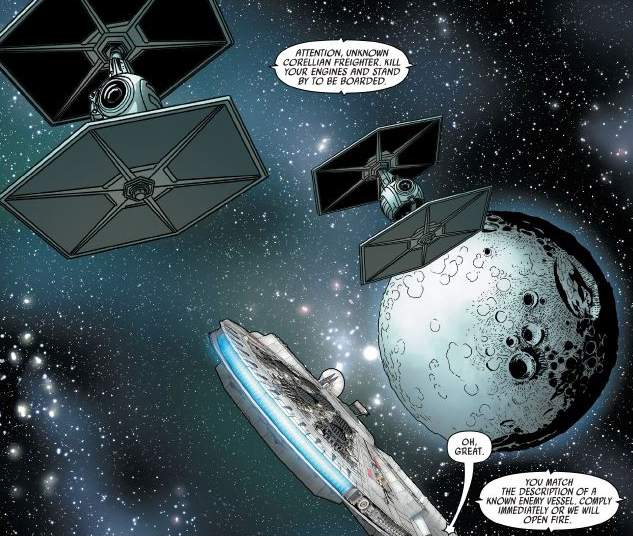 In this issue, Grakkus and Han have engaging dialogue and a run in with the empire is an exciting, yet all to brief, action sequence within the story. The ending of the issue sets up a potentially interesting character but not revealing too much as to where the story is going. Now I must address the art of Salvador Larroca in a manner I always cringe at discussing. While the majority of the issue is well illustrated, the image of Han and the few panels of Mon Motha, particularly their faces close-up, is incredibly distracting. While the rest of a panel is drawn using very traditional comic line work, Han’s face is in almost all instances photo-realistic. I don’t know if this is a combination of the pencil work and the coloring of Edgar Delgado or this is simply Larroca’s call but either way every time it appeared immediately took me out of the story. All I could focus on why Han’s face looks like that as opposed to everything else on the page. Especially when it was in direct opposition to Chewie or Grakkus, Mon Motha not so much but, still stuck out like a sore thumb. Outside of that, the art was very good along with the cover, by Mark Mayhew, I just wish it was more traditional throughout. Star Wars #35 is a good read and could have but I am hoping for bigger and better things in the future. It may be because it’s the year is winding down and annuals are starting to rear their ugly head that we are getting a lot of stand alone issues. Either way, I look forward to a return to a four to six issue run of a deeper long running story arc in the Star Wars universe.